North Carolina Based Indie Game Developer and Publisher Teams, Relevant Games and Mighty Rabbit Studios have brought you a ‘remixed’ tower defense game, which is now available on PC, Mac, and Linux via Steam Early Access. You may have heard of games from Mighty Rabbit Studios, which include games like; Saturday Morning RPG, Breach &Clear, Breach & Clear: Deadline, and from Relevant Games; Scrap Squad. There is a special promotion until October 24th, where all three different Early Access Fat Chicken bundles will be given a 15% discount. Early Access allows you to pre-order the game, then get to test it out in the early to near-final stages of the game, before the final comes out. 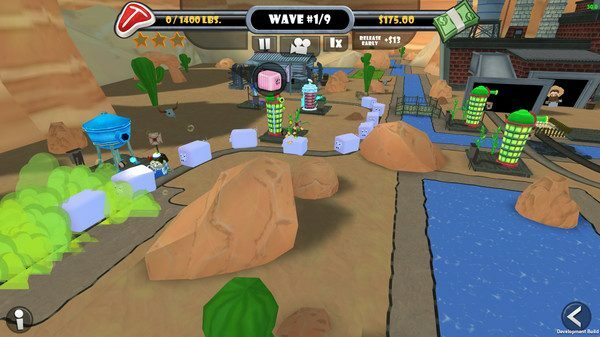 In Fat Chicken, you will get to play the role of a factory farm manager, where you will instead of blowing stuff up before it gets to the end, you will be plumping up the incoming waves of livestock as they make their way towards the slaughter house. Once plumped up, and processed through the slaughterhouse, they will be turned into tasty meat products, and then you will get to earn some money, or as its called in the game, Murderbux. A fresh and tasty take on tower defense – keep the creeps alive and happy by stuffing incoming waves of livestock with corn, growth hormones and antibiotics while growing them to epic proportions as they march to their doom at the slaughterhouse. Huge Campaign – Work your way across the U.S., hitting 13 different locations and 26 challenging levels on your quest to climb the ranks and overthrow the Fat Chicken Meat Co. Put your R&D department to work – Complete missions to unlock new equipment and tasty upgrades for your farm. Hire farm hands and “heroes” to herd, help and heal your livestock, all in the name of faster production and more meat for the market. Full Music Soundtrack – 17 original tracks from award winning composer Jason Graves, fresh off his success with the latest Tomb Raider reboot and the Dead Space series. Get an inside look at the insidious world of Factory Farming, where everything is not as “Old MacDonald” as it seems! You can find out more information on Fat Chicken via Relevant Games official site. You can follow Fat Chicken on Twitter and like Relevant Games on Facebook to keep up-to-date with Fat Chicken and other games.